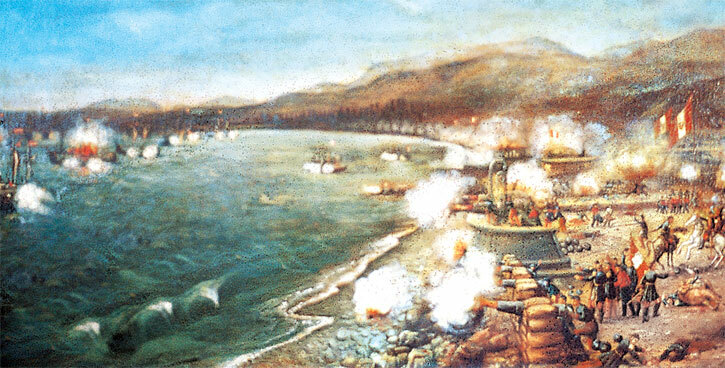 Spanish ships exchange fire with Peruvian coastal defenses at the Battle of Callao. 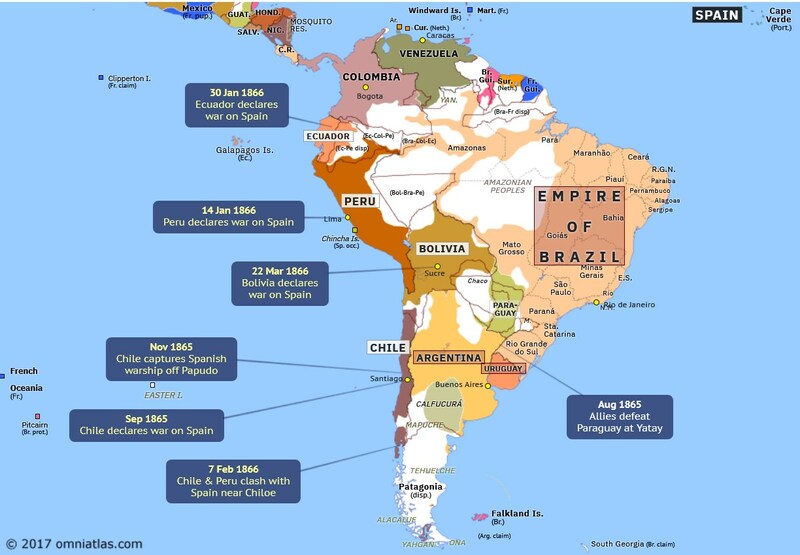 This unexpected conflict (1864–1866) between Spain and a coalition of several Latin American countries represented a belated attempt by Spain to reassert control over its former colonies. Taking advantage of the United States’ involvement in its own civil war, which undermined its ability to strenuously enforce the Monroe Doctrine (a policy that prohibited European nations from meddling in Latin America), Spain occupied the territory of the present-day Dominican Republic and then sent a naval expedition to Peru. Ostensibly on a scientific mission, the squadron’s commander, Admiral Luis Hernández Pinzon, carried secret orders to support Spanish citizens if they complained that their host nations maltreated them. The Spanish soon found reason to intervene. In 1863 group of Spanish workers charged that a Peruvian hacendado abused them. When the local courts upheld the landowner, Spain sent an envoy to protect its nationals. The Peruvian government, however, refused to meet with him until Spain recognized the existence of the Peruvian republic. Spain’s demand for compensation was ignored, so it seized the Chincha Islands off the coast of Peru in 1864. These were valuable as a source of guano, used as fertilizer. Insulted by Peru’s actions, and arguing that a state of war still existed between the two nations—they had never signed a peace treaty—Spain seized Peru’s Chincha Islands, some guano-covered spits of land. The Spanish act infuriated Peru because exports of this nitrate-rich fertilizer funded its economy. It also distressed Peru’s neighbors, particularly Chile, which organized an international congress to protest Madrid’s aggression. The Spanish remained unmoved, demanding that Peru pay 3 million pesos if it wished to regain possession of the islands. Without the revenues from guano sales, which constituted Peru’s main source of income, Lima had no choice but to capitulate. Thus in January 1865 Peru paid the extortion. 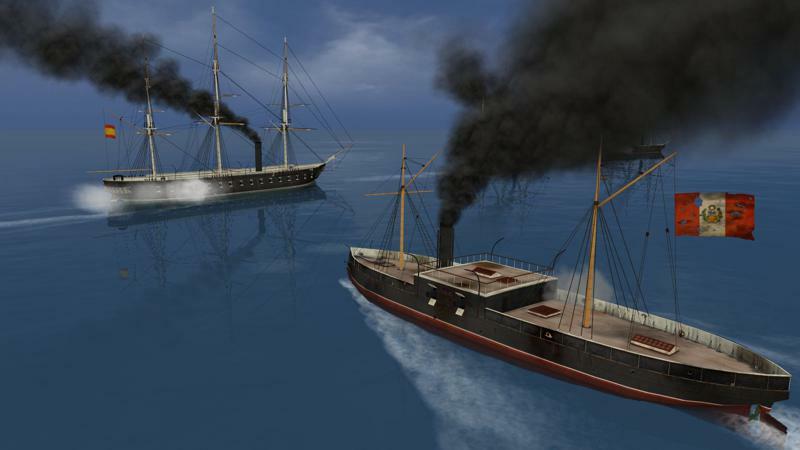 The matter still did not end: Madrid, distressed by Chilean insults, ordered its fleet south. When Chile refused to apologize for insulting the Madrid government or to fire a salute to the Spanish flag, Pareja blockaded Valparaiso. Peru’s General Mariano Ignacio Prado declared war on Spain in January 1866. Chile, fearful of a renewed Spanish presence in South America, joined Peru. It also convinced Bolivia and Ecuador to join an anti-Spanish coalition. In the maritime war that followed, Chile captured a Spanish corvette, the Covadonga, which so depressed Spanish Admiral Pareja that he committed suicide. His replacement, Admiral Casto Méndez, failed to defeat the allied fleet. Finally he demanded that Chile either fire a twenty-one gun salute to Spain or he would bombard Valparaiso. They tried to close their ports, but Spain managed to bombard Valparaiso in Chile on March 31 and Callao in Peru on May 2 before a ceasefire the following week. This was the last attempt by Spain to recapture South American territory. In the 1860s relations between Spain and its former colonies Peru and Chile deteriorated into open warfare after the Spanish seized Peru’s guano-rich Chincha Islands. Admiral Casto Mendez Nuñez steamed from Spain on board the newly built ironclad Numancia to take command of a Spanish squadron off the coast of Chile. He bombarded the port of Valparaiso in February 1866, then moved north to Peru, choosing the fortified naval base at Callao as his target. The Spanish fleet had 245 guns on board, arranged in broadside. The Peruvian armament totaled around 90 guns, including some very heavy shore guns in armored emplacements. On the morning of May 2, the Spanish ships advanced within range and a ferocious gun duel began; it lasted six hours. The Spanish vessels received many hits, especially Numancia, deliberately positioned by Mendez Nuñez in the place of greatest danger. More than 40 Spanish officers and men were killed and a further 160 were wounded, including the admiral. But the Spanish had the better of the duel, silencing almost all the shore guns with their more skillful shooting. There were some 600 Peruvian casualties, including the minister of war Juan Galvez, killed in the destruction of an armored strongpoint. The Spanish squadron subsequently left for the Philippines, leaving the bombardment without consequence. Returning home to Spain, Numancia became the first ironclad to circumnavigate the globe. Cortada, James W. Spain and the American Civil War: Relations at Mid-Century, 1855–1868. Philadelphia: American Philosophical Society, 1980. Davis, William C. The Last Conquistadores: The Spanish Intervention in Peru and Chile, 1833–1866. Athens: University of Georgia Press, 1950.